65 - 91 Following a brief marriage to a cousin, Julia Titi had a long-lasting affair with her uncle Domitian. She died well shy of her 30th birthday due to a botched abortion. RIC 219 (Domitian), C 19 Aureus Obv: DIVAIVLIAAVGVSTA - Diademed, draped bust right. Rev: No legend - Julia Titi riding elephant biga right, holding patera and scepter. $13,580 12/5/02. 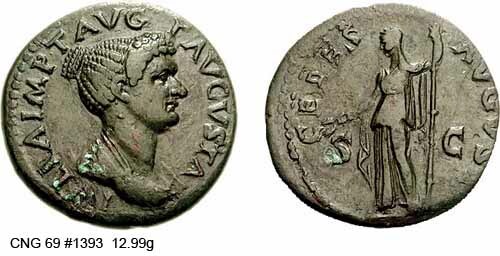 RIC 231 (Domitian), BMC 258 (Domitian), C 15 Cistophoric Tetradrachm Obv: IVLIAAVGVSTADIVITITIF - Draped bust right. Rev: No legend Exe: VESTA - Vesta seated left, holding palladium and scepter. c.82 (Ephesus). $805 5/21/03. RIC 54 (Titus), C 11 Denarius Obv: IVLIAAVGVSTATAVGF - Diademed, draped bust right. 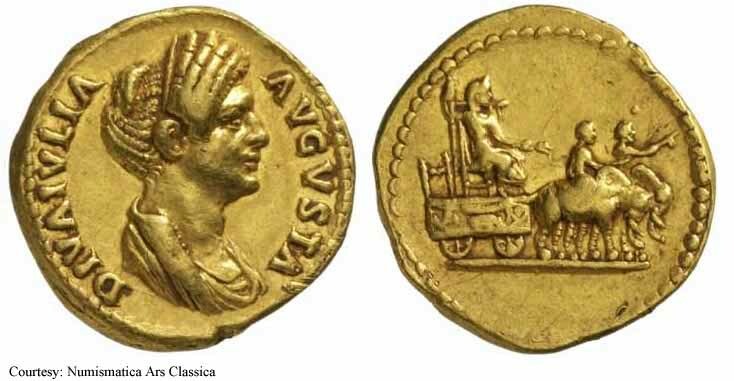 Rev: SALAVG - Salus seated left, holding patera. $1,079 10/14/02. 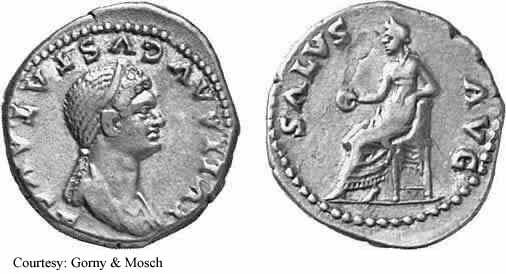 RIC 55a (Titus), BMC 140 (Titus), BN 104 (Titus), C 12 Denarius Obv: IVLIAAVGVSTATAVGF - Diademed, draped bust right. Rev: VENVSAVG - Venus standing right, leaning on column, holding helmet and scepter. c.80-81 (Rome). RIC 55b (Titus), BN 105 (Titus), C 13 Denarius Obv: IVLIAAVGVSTATITIAVGVSTIF - Diademed, draped bust right. Rev: VENVSAVG - Venus standing right, leaning on on column, holding helmet and scepter. c.80-81 (Rome). 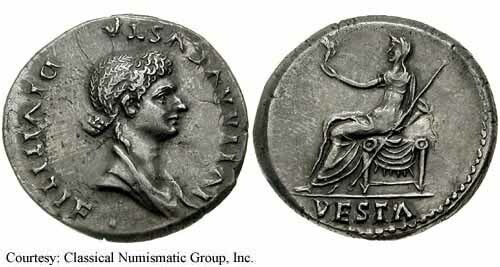 RIC 56 (Titus), BMC 141 (Titus), S 2612, C 14 Denarius Obv: IVLIAAVGVSTATITIAVGVSTIF - Diademed, draped bust right. Rev: VENVSAVGVST - Venus standing right, leaning on column, holding helmet and scepter. 80-81 (Rome). $945 4/5/03. RIC 57 (Titus), BN 108, C 16 Denarius Obv: IVLIAIMPTAVGFAVGVSTA - Draped bust right. Rev: No legend Exe: VESTA - Vesta seated left, holding palladium and scepter. c.80-81 (Rome). 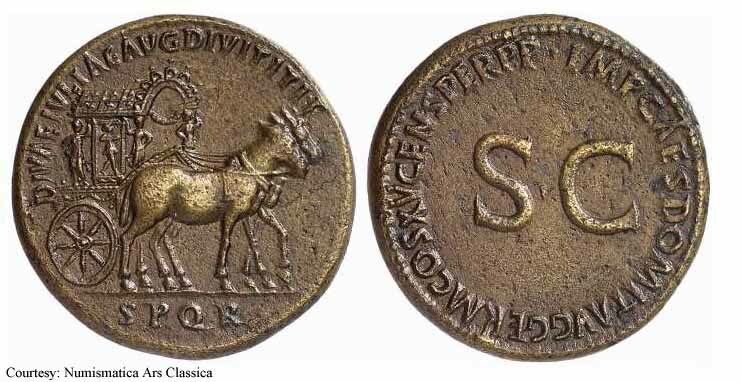 RIC 400 (Domitian), BMC 458, BN 490, C 9 Sestertius Obv: DIVAEIVLIAEAVGDIVITITIF Exe: SPQR - Carpentum drawn right by two mules. Rev: IMPCAESDOMITAVGGERMCOSXVCENSPERPP - Legend around large S C. 90-91 (Rome). RIC 177 (Titus), BMC 255, C 2 Dupondius Obv: IVLIAIMPTAVGFAVGVSTA - Draped bust right. Rev: CERESAVGVST - Ceres standing left, holding grain ears and scepter. 80-81 (Rome). 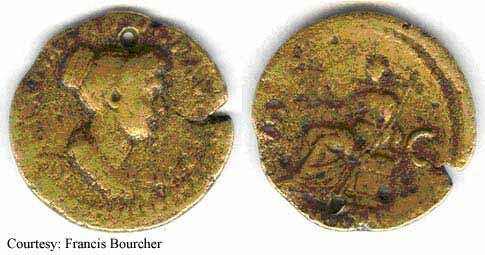 RIC 180 (Titus), C 18 Dupondius Obv: IVLIAIMPTAVGFAVGVSTA - Draped bust right. Rev: No legend Exe: VESTA - Vesta seated left, holding palladium and scepter. 80-81 (Rome).